Number Of Wounded In Mosul Is Higher Than Expected. Caring For Them Is A Challenge : Goats and Soda The number of wounded civilians and fighters is higher than expected in the battle to force ISIS from the Iraqi city. Care is coming from several sources, including U.S. forces. Medics tend to an Iraqi counterterrorism fighter injured in a clash with ISIS forces near the village of Bazwaya, on the eastern edge of Mosul. He is right here, a medic reassures him. Both men are confused and in pain but expected to survive. They are federal policemen, a national force playing a key role in the fight by Iraqi forces to take Mosul back from ISIS. More federal police casualties arrive in ambulances throughout the day. The field hospital is one of several, along with front-line points for immediate treatment of the gravely wounded, set up after the months-long Mosul operation restarted on Feb. 19. ISIS is expected to lose Mosul. But its fighters are inflicting a terrible toll. The number of civilians and combatants killed and injured has far exceeded what was predicted, with hundreds of car bombs, land mines and booby traps adding to the danger. The impact on the Iraqi armed forces has been colossal. Iraqi officials do not give figures, but American military officials have told reporters some divisions had casualty rates of 30 percent, without specifying whether the men were killed or injured. Dr. Altaf Musani, the representative for the World Health Organization in Iraq, said in the first months of the offensive, many people died for lack of urgent care. When a person is seriously wounded and in danger of bleeding to death, "there's really a window within minutes that someone should be stabilized," he said, speaking in the northern Iraqi city of Erbil. Stabilization usually means stopping the heavy bleeding caused by bullet or shrapnel wounds and making sure patients can breathe on their own while they await more treatment. Musani said typically in close vicinity to this kind of fighting, about 20 percent of the people in the area — civilians or fighters — sustain these kinds of wounds. But in Mosul that number has been much higher. Many civilians spoke of being deliberately targeted by ISIS as they left Mosul. Once the patient is stabilized, Musani said there is "a golden hour" to get them more treatment — literally about 60 minutes. In the first months of the battle for Mosul, that deadline was rarely met. Hospitals in and around the city were destroyed in the fighting and the nearest functioning medical facilities were hours away along bumpy roads. Amid the uncertainty of war, WHO planned for mass displacement more than for mass casualties. "It wasn't anticipated that people would be stranded, caught inside East Mosul," he said. ISIS forbids anyone from leaving the city. 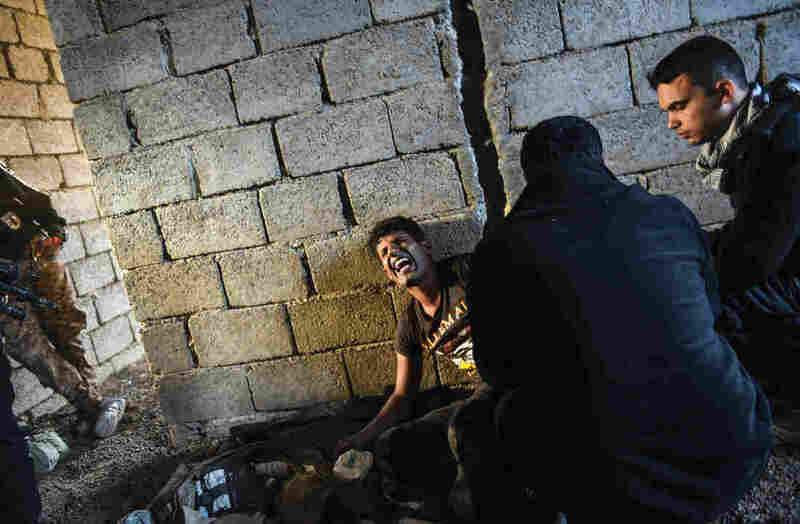 Now the World Health Organization, charities and Iraq's health ministry have scrambled to move medics closer to the front lines to stabilize the wounded and then provide comprehensive treatment. "This is very difficult," he said. "You need a certain level of medical expertise, equipment and mobility to be out in front lines in order to capture cases." One organization, Samaritan's Purse, opened a field hospital close to the east of Mosul in January in cooperation with the World Health Organization and Iraq's health ministry. They have since treated hundreds of cases and have performed multiple surgeries on a daily basis. Throughout the operation, troops from the U.S.-led coalition backing Iraqi forces have also helped on the front lines with emergency trauma care. Col. John Dorrian, the coalition's spokesman in Baghdad, confirmed the accounts from Iraqi troops. In the field hospital near Hammam al Alil, a federal policeman named Ali Qassem said U.S. forces patched him up after he was shot in the shoulder in a surprise attack by ISIS fighters on a group of his men. "We were with them 10 minutes before," he said. "We took pictures with them and joked with them, and then 10 minutes later I was injured and they came quickly. "They were very close and very helpful."